For medical gas solutions in Virginia, contact Lewis Systems Inc. We can provide you with the safest, most reliable systems available. Whether you require a medical air system for a hospital, laboratory, surgical center, or healthcare facility, Lewis Systems can provide you with a quality system that fulfills your needs. As an Amico representative, we can provide you with NFPA-99 systems in a variety of sizes and configurations. 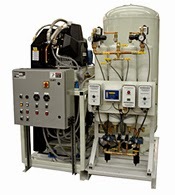 Complete medical air and gas systems packages for Amico compressors include standard HMI control panel, air compressors, accessories (inline intake filter, non-return valve on outlet, flexible inlet and outlet couplings, shut-off valves, pressure release valve, condensate separator and drains, and unloader valve), air receivers, and dryer systems. Download the Source Equipment Sizing Guide. Lewis Systems can also provide you with medical gas solutions produced by Powerex and Tri-Tech. Complete packages are available and are fully compliant with NFPA requirements. Powerex systems provide both open and enclosed oil-less scroll systems that are quiet, energy efficient, and easy to maintain as well as designed to save space. Make Lewis Systems your medical air and gas systems specialists in Virginia. Contact us today for more information about our medical gas solutions and services.